Ascending Butterfly: Organize your Finances, Subscriptions and Rewards in a Cloud for a chance to win $1000! Organize your Finances, Subscriptions and Rewards in a Cloud for a chance to win $1000! Last month I got a sneak peek into Manilla, a new household account organization site, and I wanted to share the scoop with you! 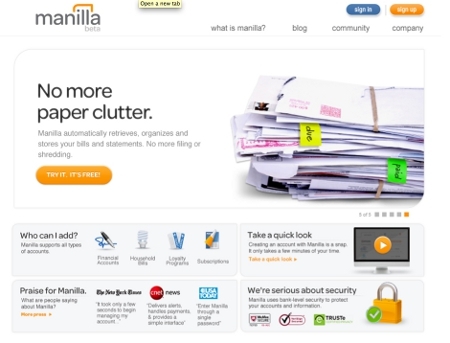 Manilla will give you the chance to not only organize your household Finances and more, they are also doing an amazing Giveaway in June where one lucky new user will win $1,000 cash to pay their bills! A chance to get paid for getting organized, how cool is that? Manilla will help you manage multiple cloud services with a single sign on, it offers a single place to go for online bill paying. While most Banks do offer that service already, Manilla takes this a bit further by also offering a place to manage frequent flier accounts, managing magazine subscriptions (no more renewal notices as Manilla will let you know when your subscriptions are due), and it even creates a virtual filing cabinet for you making things loads easier for you come tax time. All of your account info is consolidated using an easy-to-read dashboard. Think of it as a GPS for your household management, giving you not only easy to understand directions on how to get you from point a to point b, but also saving you time, reducing clutter and paperwork and from June 7-30, 2011 you will also have the chance to win $1,000 just for trying them out! Note: While various blogs are sharing the love about Manilla just remember the maximum number of entries per person is 1 regardless of number of blogs visited for entry. Are you thinking what I'm thinking? ah Manilla, where have you been all my life? FTC Disclosure: This is a sponsored conversation written by me on behalf of Manilla. The opinions and text are all mine. All opinions are my own. Contest runs June 7-30, 2011. Winner must be signed up with Manilla with at least one account linked to win. A random winner will be selected by July 1, 2011. Entry Limit: One (1) Manilla account can be setup per household, one (1) entry per household regardless of number of comments, per each Participating Blog – maximum number of entries per person is 1 regardless of number of blogs visited for entry. Prize(s): One winner will receive a $1,000 gift card/cash. Gift card is subject to the terms and conditions associated with its use. Total average retail value of all prizes is $1,000.00. Odds of winning depend on total number of eligible entries received from all Participating Blogs. Unclaimed prizes will not be awarded if not claimed within two weeks of being notified. All applicable federal, state, and local taxes on prizes are the sole responsibility of the prize winners. Limit one (1) prize per person in the Contest. Winner Selection: One (1) winner from all Participating Blogs will be selected in a random drawing no later than 7/1/11 from among all eligible entries received. Winner must have a Manilla account with at least one account linked to win. Winner will be notified by email. In the event the Sponsor is unable to contact the winner within two weeks of first notification attempt, prize will be forfeited and an alternate winner may be selected.